Between the glories of Rome and the rise of national states stood an age in which each land was defined by the virtue and failings of its monarch. 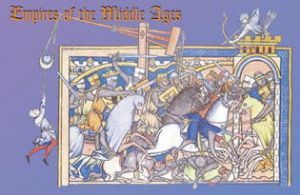 Empires of the Middle Ages is a multi-player game of diplomacy in which up to six may act as dynasts and attempt to build their historic kingdoms into vast empires. Empires of the Middle Ages is played on a map of medieval Europe on which the players record the power of their kingdoms. Playing cards resolve the basic actions of the game, while random event cards add period flavor, such as plagues, crusades and heresy. Six scenarios are included, from a solitaire game to a grand scenario covering the entire Middle Ages.